Artur Bergman, founder of a CDN exclusively powered by super fast SSDs, has made many compelling cases over the years to use them. He was definitely ahead of the curve here, but he’s right. Nowadays, they’re denser, 100x faster and as competitively priced as hard disks in most server configurations. At Etsy, we’ve been trying to get on this bandwagon for the last 5 years too. It’s got a lot better value for money in the last year, so we’ve gone from “dipping our toes in the water” to “ORDER EVERYTHING WITH SSDs!” pretty rapidly. This isn’t a post about how great SSDs are though: Seriously, they’re amazing. The new Dell R630 allows for 24x 960GB 1.8″ SSDs in a 1U chassis. That’s 19TB usable ludicrously fast, sub millisecond latency storage after RAID6, that will blow away anything you can get on spinning rust, use less power, and is actually reasonably priced per GB. So if this post isn’t “GO BUY ALL THE SSDs NOW”, what is it? Well, it’s a cautionary tale that it’s not all unicorns and IOPs. When SSDs first started to come out, people were concerned that these drives “only” handled a certain number of operations or data during their lifetime, and they’d be changing SSDs far more frequently than conventional spinning rust. Actually, that’s totally not the case and we haven’t experienced that at all. We have thousands of SSDs, and we’ve lost maybe one or two to old age, and it probably wasn’t wear related. When was the last time your hard disk failed because the firmware did something whacky? Well, Seagate had a pretty famous case back in 2009 where the drives may not ever power on again if you power them off. Whoops. But the majority of times, the issue is the physical hardware… The infamous “spinning rust” that is in the drive. So, SSDs solve this forever right? No moving parts.. Measured mean time to failure of hundreds of years before the memory wears out? Perfect! Okay, bad start, we’ve actually had no issues with Intel. This seems to be common across other companies we’ve spoken to. We started putting single 160GB in our web servers about 4 years ago, because it gave us low power, fast, reliable storage and the space requirements for web servers and utility boxes was low anyway. No more waiting for the metal to seize up! We have SSDs that have long outlived the servers. Outside of the 160GB Intel drives, our search (Solr) stack was the first to benefit from denser, fast storage. Search indexes were getting big; too big for memory. In addition, getting them off disk and serving search results to users was limited by the random disk latency. Rather than many expensive, relatively fast but low capacity spinning rust drives in a RAID array, we opted for OCZ Talos 960GB disks. These weren’t too bad; we had a spate of initial failures in what seemed like a bad batch, but we were able to learn from this and make the app more resilient to failures. However, they had poor SMART info (none) so predicting failures was hard. Unfortunately, the company later went bankrupt, and Toshiba rescued them from the dead. They were unavailable for long enough that we simply ditched them and moved on. We briefly tried running third party SSDs on our older (HP) Graphite boxes… This was a quick, fairly cheap win as it got us a tonne of performance for relatively little money (back then we needed much less Graphite storage). This worked fine until the drives started to fail. Unfortunately, HP have proprietary RAID controllers, and they don’t support SMART. Or rather, they refuse to talk to non-HP drives using off the shelf technology, they have their own methods. Slot an unsupported disk or SSD into the controller, and you have no idea how that drive is performing or failing. We quickly learnt this after running for a while on these boxes, and performance randomly tanked. The SSDs underlying the RAID array seemed to be dying and slowing down, and we had no way of knowing which one (or ones), or how to fix it. Presumably the drives were not being issued TRIM commands either. When we had to purchase a new box for our primary database this left us with no choice: We have to pay HP for SSDs. 960GB SSDs direct from HP, properly supported, cost us around $7000 each. Yes, each. We had to buy 4 of them to get the storage we needed. On the upside, they do have fancy detailed stats (like wear levelling) exposed via the controller and ILO, and none have failed yet almost 3 years on (in fact, they’re all showing 99% health). You get what you pay for, luckily. Samsung saved the day and picked up from OCZ with a ludicrously cheap 960GB offering, the 840 EVO. A consumer drive, so very limited warranty, but for the price (~$400-500) you got great IOPS and they were reliable. They had better SMART info, and seemed to play nicely with our hardware. I hinted that we used these for Graphite. They worked great! 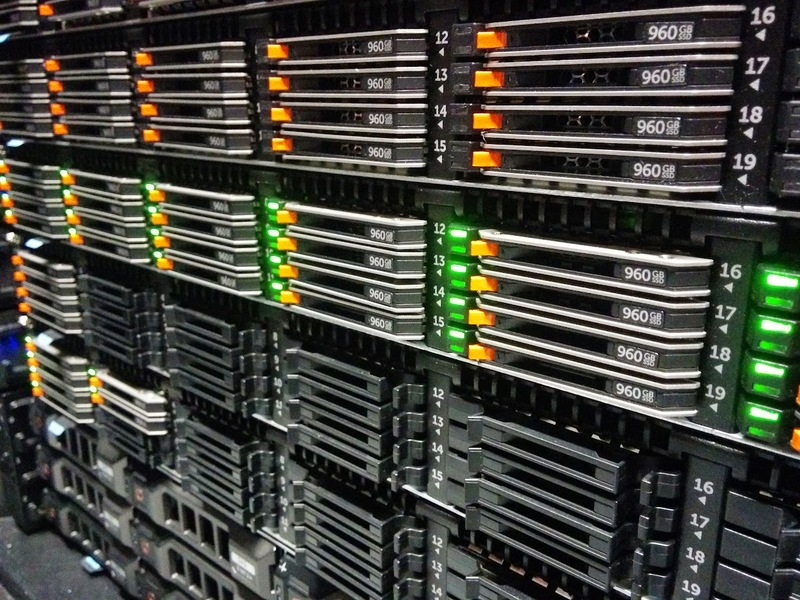 Who wouldn’t want thousands and thousands of IOPs for relatively little money? Buying SSDs from OEMs is still expensive, and they give you those darn fancy “enterprise” level drives. Pfft. Redundancy at the app level, right? We had started buying Dell, who use a rebranded LSI RAID controller so they happily talked to the drives including providing full SMART info. We had 16 of those Samsung drives behind the Dell controller giving us 7.3TB of super fast storage. Given the already proven pattern, we ordered the same spec box for a Ganglia hardware refresh. And they didn’t work. The RAID controller hung on startup trying to initialise the drives, so long that the Boot ROM was never loaded so it was impossible to boot from an array created using them. "MegaCli -AdpAllInfo -a0 | diff"
Weeks of debugging and back and forth with both Dell (who were very nice given these drives were unsupported) and Samsung revealed there were definitely firmware issues with this particular BB6Q release. It was soon released publicly, that not only did this new firmware somehow break compatibility with Dell RAID controllers (by accident), but they also had a crippling performance bug… They got slower and slower over time, because they had messed up their block allocation algorithm. In the end, behind LSI controllers, it was the controller sending particular ATA commands to the drives that would make them hang and not respond.. And so the RAID controller would have to wait for it to time out. Samsung put out a firmware updater and “fixer” tool for this, but it needed to move your data around so only ran on Windows with NTFS. With hundreds of these things that are in production and working, but have a crippling performance issue, we had to figure out how they would get flashed. An awesome contractor for Samsung agreed that if we drove over batches of drives (luckily, they are incredibly close to our datacenter) they would flash them and return them the next day. This story has a relatively happy ending then; our drives are getting fixed, and we’re still buying their drives; now the 960GB 850 PRO model, as they remain a great value for money high performance drive. Talking with other companies, we’re not alone with Samsung issues like this, even the 840 PRO has some issues that require hard power cycles to fix. But the price is hard to beat, especially now the 850 range is looking more solid. LiteOn were famously known for making CD writers back when CD writers were new and exciting. We decided to buy new SSD based database boxes, because SSDs were too hard to resist for these use cases; crazy performance and at 1TB capacity, not too much more expensive per GB than spinning rust. We had to buy many many 15,000rpm drives to even get near the performance, and they were expensive at 300GB capacity. We could spend a bit more money and save power, rack space, and get more disk space and IOPs. For similar reasons to HP, we thought best to pay the premium for a fully supported solution, especially as Samsung had just caused all these issue with their firmware issues. With that in mind, we ordered some R630’s hot off the production line with 960GB LiteOn’s, tested performance, and it was great: 30,000 random write IOPs across 4 SSDs in RAID6, (5.5 TB useable space). We put them live, and they promptly blew up spectacularly. (Yes, we had a postmortem about this). The RAID controller claimed that two drives had died simultaneously, with another being reset by the adapter. Did we really get two disks to die at once? This took months of working closely with Dell to figure out. Replacement of drives, backplane, and then the whole box, but the problem persisted. Just a few short hours of intense IO, especially on a box with only 4 SSDs would cause them to flip out. And in the mean time, we’d ordered 50+ of these boxes with varying amounts of SSDs installed, having tested so well initially. Eventually it transpires that, like most good problems, it was a combination of many factors that caused these issues. The SSDs were having extended garbage collection periods, exacerbated by a smaller amount of SSDs with higher IO, in RAID6. This caused the controller to kick the drive out of the array… and unfortunately due to the write levelling across the drives, at least two of them were garbage collecting at the same time, destroying the array integrity. The fix was no small deal; Dell and LiteOn together identified and fixed weaknesses in their RAID controller, the backplane and the SSD firmware. It was great to see the companies working together rather than just pointing fingers here, and the fixes for all sizes except 960GB was out within a month. The story here continues for us though; the 960GB drive remains unsolved, as it caused more issues, and we had almost exclusively purchased those. For systems that weren’t fully loaded, Dell kindly provided us with 800GB replacements and extra drives to make up the space. For the rest, because the stress across the 22 drives means garbage collection isn’t as intense, so they remain operating until a firmware fix. I’m hesitant to recommend any one particular brand, because I’m sure as with the hard disk phenomenon (Law where each person has their preferred brand that they’ve never had issues with but everyone else has), people’s experiences will have varied. We should probably collect some real data on this as an industry and share it around; I’ve always been of the mindset that we’re weirdly secretive sometimes of what hardware/software we use but we should share, so if anyone wants to contribute let me know. But: you can probably continue to buy Intel and Samsung, depending on your use case/budget, and as usual, own your own availability and add resiliency to your apps and hardware, because things always fail in ways you can’t imagine. Without going into the basics about systemd too much (I quite enjoy this post as an intro), you tell systemd to run your executable using the “ExecStart” part of the config, and it will go and run that command and make sure it keeps running. Wonderful! In this case, we wanted to keep HHVM running all the time, so we told systemd to do it, in 3 lines. Waaaay easier than sys-v init. By default when you tell systemd to stop a process, and you haven’t told it how to stop the process, it’s just going to gracefully kill the process and any other processes it spawned. However, there is also the ExecStop configuration option that will be executed before systemd kills your processes, adding a new “deactivating” step to the process. It takes any executable name (or many) as an argument, so you can abuse this to do literally anything as cleanup before your processes get killed. Systemd will also continue to do it’s regular killing of processes if by the end of running your ExecStop script the processes are not all dead. We have a load balancer that uses a bunch of health checks to ensure that the node that it’s asking to do work can actually still do work before it sends it there. One of these is hitting an HTTP endpoint we set up, let’s call it “status.php” which just contains the text “Status:OK”. This way, if the server dies, or PHP breaks, or Apache breaks, that node will be automatically depooled and we don’t serve garbage to the user. Yay! Armed with my new ExecStop super power, I realised we were able to let the load balancer know this node was no longer available before killing the process. If we hit 30 seconds and the load isn’t 0 or we still can’t reach the endpoint, we just carry on anyway; something is wrong. Now when I call service hhvm stop, it takes 6-10 seconds for the stop to complete, because the traffic is gracefully removed. Another thing I personally love about systemd, is the increase visibility the operator gets about what’s going on. In sys-v, if you’re lucky, someone put a “status” action in their bash script and it might tell you if the pid exists. 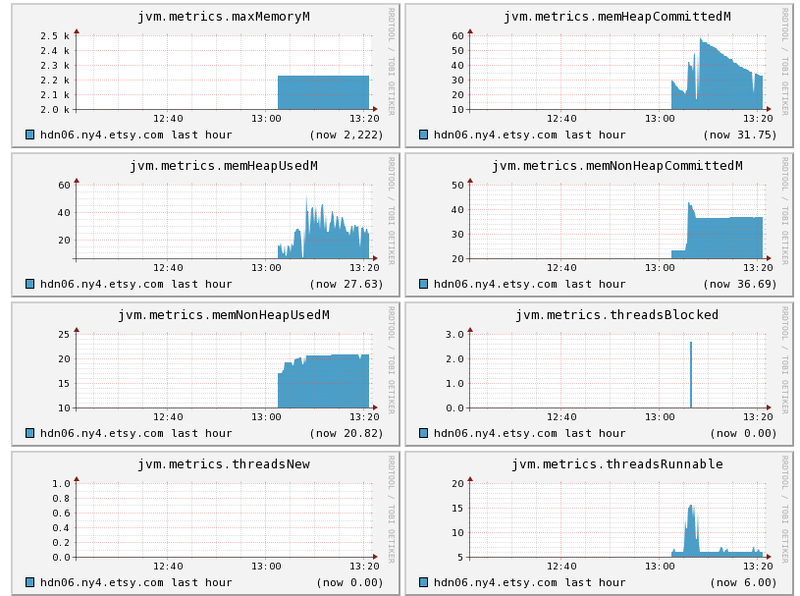 Feb 17 22:00:50 hhvm01 hhvm_stop.sh: Load was 0 after 11 seconds, now we can kill HHVM. Feb 17 22:00:52 hhvm01 systemd: Stopped HHVM HipHop Virtual Machine (FCGI). Now all the information about what happened during the ExecStop process is captured for debugging later! No more having no idea what happened during the shut down. When the script is in the process of running, the systemd status output will show as “deactivating” so you know it’s still ongoing. This is just one example of how you might use/abuse the ExecStop to do work before killing processes. Whilst this was technically possible before, IMO the ease of use and the added introspection means this is actually feasible for production systems. I’ve gisted a copy of the script here, if you want to steal it and modify it for your own use. Today I was faced with the problem of setting the IP address of a DRAC (dedicated Dell Remote Access Card, which are super by the way, and a lot lot quicker than Sun’s effort) in a Dell server that was powered on, running something production on the Debian OS, and I had no physical access to the server, so no rebooting for configuration was possible. Within a minute the card should be up and responding to ping. Hurrah! Note: I tried these on a DRAC4 card, and whilst it looked like it was accepting my instructions, it seems it was infact completely ignoring me. I had to configure this one manually in the BIOS. These commands work fine on a DRAC5 though. Being my browser of choice anyway, I set everything up in Firefox to start with. We figured Linux desktop would be more stable for hosting this rather than Windows. F11 to fullscreen mode on both the monitors, and off it goes. We didn’t notice it too much at the time, but it’s pretty annoying the way it deals with the refreshing of the images.. It clears the page, and loads the images one by one, leading to a noticable flashing of the screen every time it reloads the page. Not only that, it was the worst browser we used, leading to 90% RAM usage (on a 2gb machine) after just a day. At this point, not only did it become very sluggish, but it would stop displaying the graphs randomly, and eventually ending up in severe corruption of all the images, mixing them together in an interesting fashion. Connecting via VNC every day and restarting Firefox became a bit of a chore, so we decided to give up and try something else. Straight away Opera was performing much better than Firefox. It seemed to almost pre-load the images for the next set of graphs before it refreshed the page, leading to no flickring of the screen, just seamless re-loading of the page. It also managed a week before showing any signs of slowing down, but after that point the graphs started disappearing again. Opera had suffered the same fate as Firefox… Using all the memory available on the machine. We also had another little problem.. We have the time printed in the bottom right of the screen (as text rather than an image) and even by forcing cache control headers, Opera was caching the pages. The clock would move between 5-10 minutes as each graph appeared. I discovered that Opera has some advanced preferences that lets you disable the cache completely. Whilst this fixed the problem with the clock, it meant that it then only survived 2-3 days before exhausting the memory usage. We put up with this for a number of months, before deciding to move on. Turning the two different pages we use into their own Apps using the Google Gears “Create application shortcut” menu option. Now we have a single icon to click to open one window, and another for the other. The biggest win by far – It leaks very little memory. So far after using it for a week, the process running the text only Nagios view has not used any more RAM than it did when we started it (35mb). 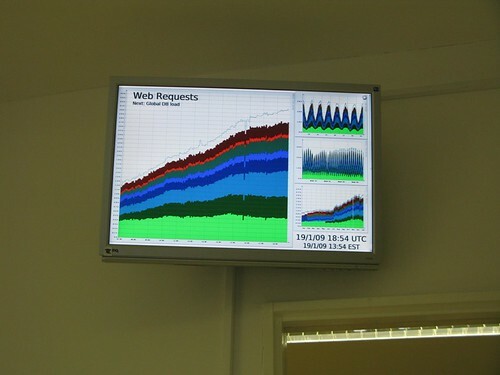 The Cacti graphs screen, reloading graphs 24/7 for a week every 20 seconds has used just 80mb (40mb when it started). The reason for this is obvious; if you watch the usage, it loads the page, the memory increases by 5mb. After a few secnods, it drops by 5mb again. So there is a small memory leak somewhere but it seems Chrome is cleaning up after itself almost immediately, something which the other 2 browsers failed miserably at. The overall functionality of the system is much the same.. I have compiled a couple of exe’s so that one switches off the displays and one turns them back on again (This combined with Task Scheduler means we save the planet whilst we’re not at work!) 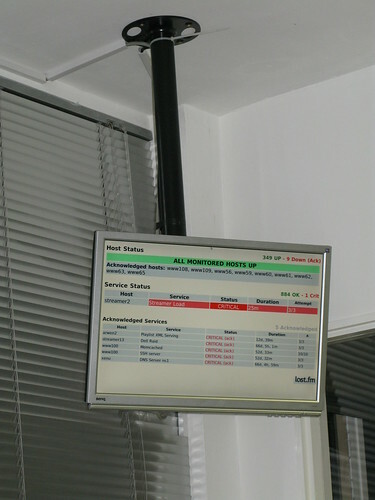 and VNC server functions actually better on Windows than on Linux (for some reason the secondary monitor displayed as a black screen on Linux, so you could control but not see it). The only downside of the Google Chrome based solution is: Webkit doesn’t support “text-decoration: blink”! In the image linked above, you can see we use the text CRITICAL for a service that is broken, and DOWN for a host that is having an issue. These used to blink, which was a nice touch to draw your eye to the issue. This is about the only valid use of “text-decoration: blink” I can think of, but unfortunately the webkit developers have chosen not to support it. Any support on this ticket would be appreciated! We’re currently using the bleeding edge dev version, simply because it was the only version that had F11 Full screen mode in. This works very well, and it’s also very stable for a bleeding edge release (although obviously we aren’t using it like a regular browser). If you’re after a browser that can handle sitting there all day and night happily refreshing a page, and you don’t mind running Windows (for now, anyway) then it seems Google Chrome may be your best bet. I will continue to evaluate it’s performance and maybe one day we can find something even better. Any comments are welcome and we’re still open to suggestions, although I’m pretty happy I won’t have to restart Chrome for a few months if this trend continues! So we launched a super exciting new beta today.. It’s not very finished, and it’s going to get a lot better, but I’m very excited and here are some quick reasons why. Activity feeds. For me, I can remember what I shouted, who i added as my friend, what forum posts I made, and more. For my friends, the same, and I can see what’s going on with them. For any other resource: interesting stuff that people have done. Simple but so effectively because its live. Live updating charts. This makes me happy, because the charts look more like Audioscrobbler ones, and not only that they update every single damn play. Yay! Every single play means something new to look at! Notifications. Easy way to see shoutbox posts and other stuff, other than checking my email. On the fly recommendations. Again, live updating goodness. No need to explain that! Library. Big, shiny, pretty view of everything you ever played. And finally you can delete that stuff you thought “jesus, why did I play that”? Apparently I listened to 50 cent! I never realised! Loved Tracks. They’re finally useful! Remember those tracks you loved but you never remembered because we didn’t have them streamable. The design. I wasn’t sure about it at first, but I think it’s looking pretty nice. Much more up to date than it was before, but it’s got a little way to go. There are tonnes more awesome stuff going on, and more stuff to be tweaked, improved on, and cool stuff to be added, we’re not done yet! But it’s 11:30 and I’m not exactly sober. Goodnight! I got this wonderful Blackberry device courtesy of work, since I’m on call and people want emails answering quickly etc, etc. On a first search there was plenty of good IRC clients around. Unfortunately I couldn’t get any to work… They just said disconnected from server. Using MidpSSH I telnet’d to the server and got a connection refused.. Then I changed the connection method to “TCP” and it worked fine. Great! But no such option exists in any IRC client (Mobilirc is the best one at the moment it seems). So, the BES won’t forward the traffic, the BES isn’t even managed by us, and both apps are open source. Let’s delve into the code! After a couple of hours of trying to get the Blackberry Development Environment working for me, I managed to get a .jar, .jad, .alx, .cod, and using javaload, got it on my device and SUCCESS! IRC running, backgrounded, highlights, always on. Hurrah!